Source of Support: This article was derived from an approved study in the Isfahan University of Medical Sciences and has no financial support, Conflict of Interest: Nil. Background: Endotracheal suctioning (ETS) is an essential procedure performed for mechanically ventilated patients. ETS can be either performed by open or closed suctioning system (CSS). There may be some concern on how closed-system ETS is practiced by intensive care nurses. This study was designed to investigate closed-system ETS practices of critical care nurses and to compare their practice with standard recommendations. Materials and Methods: A prospective observational study was conducted during August and December 2012 to establish how critical care nurses (N = 40) perform different steps in a typical ETS practice and to compare it with the current best practice recommendations through a 23-item structured checklist. The results were categorized into three sections: Pre-suctioning, suctioning, and post-suctioning practices. Results: Pre-suctioning, suctioning, and post-suctioning practices mean scores were 7.5, 11.75, and 8.5, respectively, out of 16, 16, and 12, respectively. The total suctioning practice score was 27.75 out of 44. Most discrepancies were observed in the patients' assessment and preparation, infection control practices, and use of an appropriate catheter. Spearman correlation coefficient indicated a significant statistical positive correlation between suctioning education period and suctioning practice score (P < 0.0001) and between working experience and suctioning practice score (P = 0.02). Conclusions: The findings revealed that critical care nurses do not fully adhere to the best practice recommendation in CSS. We recommend that standard guidelines on ETS practice be included in the current education of critical care nurses. Most of the critically ill patients in the intensive care units require the use of mechanical ventilation. These patients need endotracheal suctioning (ETS) to prevent partial or complete endotracheal tube obstruction. ETS is one of the most common and important procedures performed for the patients requiring mechanical ventilation. These patients are unable to spontaneously clear their airways, and ETS clears the endotracheal tree from secretions, assures adequate oxygen supply, avoids obstruction of the tube lumen,, decrease patients breathing work, and prevents atelectasis and pulmonary infection. Although ETS may be a necessary procedure, it can be associated with some potentially harmful effects including hypoxemia due to interruption of the mechanical ventilation and subsequently loss of lung volume, vasovagal response, arrhythmia, and hypotension, bleeding, and cross infection.,, Two suctioning systems are available in the settings: open and closed suctioning systems. Open system suctioning (OSS) is the conventional suctioning technique, which requires disconnecting the patient from the ventilator during ETS. It involves suctioning the airway using a single-use catheter, and then reconnection of the patient to the ventilator and discarding the suctioning catheter. In contrast, closed suctioning system (CSS) can remain in line for 24 h and, thus, can be used for multiple ETS procedures., This multiple-use catheter is enclosed in a plastic sheath; therefore, the nurse is not exposed to patient's airway secretions. Nowadays, OSS has been partly replaced by CSS. CSS has become very popular in the intensive care units, as ventilation continues during the suctioning procedure and consequently decreases the loss of lung volume and avoids gas exchange impairment while ETS is performed. Maintaining a positive end-expiratory pressure (PEEP), decreasing contamination of the environment, convenience of the system, saving time in equipment set-up and clean-up, and reducing the anxiety in patients are among the advantages of this system. It potentially lowers the costs, especially when the patients need repeated suctioning. There are several other advantages for using CSS. ETS is one of the most important procedures performed by critical care nurses. Critical care nurses, as one of the important members of a multidisciplinary team, play the main role in care of critically ill patients. In fact, these patients are highly dependent on skilled nurses throughout all aspects of their care, especially airway management and clearance. Clearing the mechanically ventilated patients' airways by ETS is an inevitable procedure, which is one of the concerns in nursing practice, as it is potentially a harmful intervention that can cause serious complications, when performed inappropriately or incorrectly. Several studies have been performed on nursing practice in ETS procedure. Swarts et al. and Sole et al. have mentioned that nursing practice in ETS of critically ill patients varies widely between institutions and practitioners. In their study, Paul-Allen and Ostrow aimed to identify the closed-system ETS practices of nurses and reported some variations in the suctioning procedure. Other studies have also demonstrated that nurses' practice with ETS is based on their personal experience and the ward routine over any other sources., ETS can cause life-threatening effects, and should be implemented based on standard protocols and be evidence-based as evidence-based care promotes quality outcome by decreasing the mortality, morbidity, costs, length of hospitalization, and improvement of the patients' recovery. As CSS has recently been adopted in the hospitals in Iran and is still new in most of the settings, an observational study was necessary to investigate nurses' closed suctioning practice to assess an actual nursing practice. The aim of this study was to investigate closed-system ETS practices of critical care nurses and to compare their practice with standard recommendations. A non-participant structured observational design was used in the present research to collect data concerning nurses' practice prior to, during, and after endotracheal closed suctioning. Observational studies are comprehensive studies conducted to investigate practice as in this method, data are collected based on participants' observations in a natural environment and real situation., After obtaining approval for the research in Isfahan University of Medical Sciences and getting permission from the hospital nurse manager and the head nurse in the ward, the researcher has accessed the study setting, and Amin hospital was selected. After sampling, the targeted population was informed about the study details and their right to withdraw from the study any time they liked. The study was conducted for two consecutive months in two general adult ICUs on the patients requiring mechanical ventilation or high dependency care. There were two wards with 40 nurses (n = 20 in each ward). Each nurse was allocated for two patients per shift. As a routine, the nurses carried out ETS. The wards had adopted CSS for all intubated patients since 1 year prior to the study. The targeted population in this study comprised critical care nurses in the two ICUs. Sampling was conducted in several shifts and two suctioning events were observed per nurse in one shift. Then, the most appropriate method was deemed as a sample. All 40 full-time ICU nurses with a minimum of 1 year ICU experience were considered eligible for the study. One year is an appropriate time for all nurses to have the same practice and knowledge base. Data on the practice of nurses using the CSS were collected using a 23-item structured observational checklist. This checklist was made after studying the standard suctioning guidelines in several references,,,,, and was distributed for content validity appraisal to a range of experts including faculty members of the medical-surgical and critical care nursing departments in Isfahan Nursing and Midwifery School, as well as two senior nursing intensive care practitioners. In the pilot study, the observational checklist was checked for inter-rater reliability using split-half method, and the Spearman correlation coefficient was 0.959. Each item in the 23-item checklist was weighted with 0 and 1, or 0 and 2 depending on the strength of its effects on ETS, based on evidences., Nurses' practice in using CSS was observed, and the checklist was ticked in three time points: prior to suctioning, during the suctioning event, and post-suctioning practice. Recommended best practice was developed by calculating the highest score in each item, which was 44 representing perfect adherence to the best practice recommendations. The checklist was also designed to elicit nurses' working experience in ICU, nurses' level of education, and passing the educational course for CSS. Practice of all 40 nurses was observed and the checklists were ticked. At the end of sampling, the details and purpose of study were described for the study population. None of the subjects were excluded from the study. The data were analyzed by descriptive statistics including frequency rating and percentage for nominal-level data. Spearman correlation coefficient was used for finding the correlation between baseline variables and suctioning practice scores. P <0.05 was considered as statistically significant. Ethical approval to conduct the study was obtained from the appropriate research committee, and all participants were informed that their participation was voluntary and that their right to withdraw the study would be respected at the all time. During 1 month of the study, 80 checklists were ticked for 40 nurses working in two ICUs. None of the participants were excluded from the study. All the subjects were women. 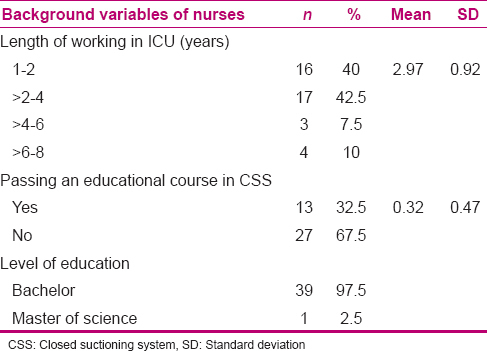 Baseline variables such as nurses' length of working in ICU, passing their training course in CSS, and educational are presented in [Table 1]. About 42.5% of nurses had more than 2–4 years of ICU experience. Participants' mean work experience in an ICU was 2 years and 9 months. About 97.5% of nurses had a bachelor's and 2.5% had a master's degree in nursing. Thirteen nurses (32.5%) had passed the CSS educational course. In accordance with the main data of the observational checklist, the results were categorized into three sections: practices prior to suctioning, during the suctioning event, and post-suctioning practices. Nurses' practice prior to suctioning is shown in [Table 2]. To assess the need for ETS, 4 nurses (10%) auscultated the patients' chest, 11 nurses (27.5%) prepared the patients and explained the necessities of the procedure in several forms, and more than half of the nurses (27, 67.5%) positioned the patients in a semi-fowler position if it was possible. About 28 participants (70%) performed hyperoxygenation for the patients prior to ETS and 29 ICU nurses (72.5%) performed NaCl instillation prior to suctioning to dilute the secretions. In relation to hand washing prior to the procedure, disparities in practice were noted and only 7 nurses (17.5%) washed their hands, 36 (90%) did not wear goggles, but all the participants were fully compliant with the best practice in relation to wearing gloves. 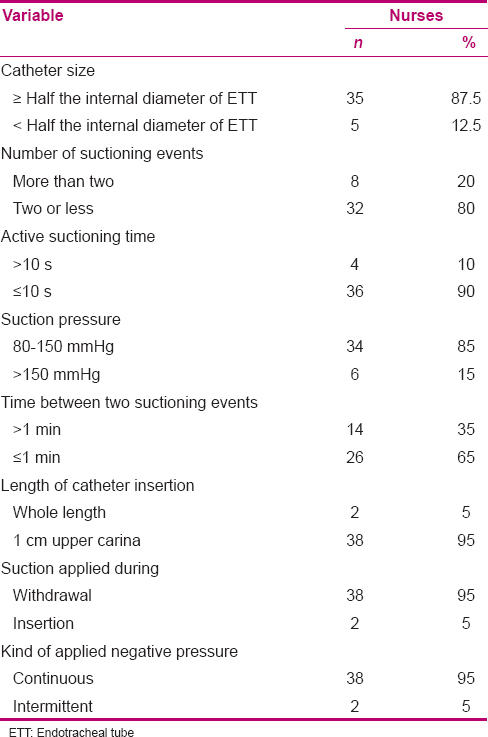 Most of the participants (87.5%) used a catheter that was larger than half of the internal diameter of endotracheal tube (ETT), which was against the recommended size for suctioning [Table 3]. Also, 20% of the nurses suctioned patients more than the maximum number in each suctioning episode (two times), but most of them (90%) complied with the best practice recommendation in relation to suctioning time (less than 10 s). About 95% of the participants inserted the appropriate length of catheter, and applied negative pressure for less than 10 s based on continuous method, which is found in most of the guidelines. About 15% of the participants exceeded the recommended suction pressure of 80–150 mmHg. One minute is the appropriate length of time between each suctioning episode, with which 35% of the participants were not compliant. Two nurses (5%) did not notice the black indicator when removing the suctioning catheter from the ETT. Existence of this indicator at the end of catheter represents the complete withdrawal of suctioning catheter from the ETS. Also, 13 nurses (32.5%) failed to hyperoxygenate the patients at the end of the procedure. Similar to the first step, most of the participants (95%) did not evaluate the effectiveness of suctioning by the chest auscultation. Six participants (15%) left the suctioning port open, in contrast to CSS recommendations [Table 4]. In relation with infection control principles, 33 participants (82.5%) failed to wash their hands after the procedure. All the participants complied with the best practice recommendations in relation with closed-suctioning catheter irrigation and procedure documentation. Frequency distribution was used to evaluate the suctioning practices scores and their quality with the best practice score [Table 5]. Suctioning procedure scores ranged totally from 20 to 36. In suctioning three sections, the highest mean score, in suctioning event practices, was 11.75 (1.51) and the lowest mean score, in pre-suctioning practices, was 7.5 (2.66). Results of the Spearman correlation coefficient showed a statistically significant positive correlation between passing the suctioning education period and suctioning practices scores (P = 0.00) and between the length of working in ICU and suctioning practices scores (P = 0.02). This study compared the current ETS procedure, conducted by the closed system, and the best practice recommendations. According to the best practice ETS recommendations, as ETS has several disadvantages, assessment of the patients concerning the presence of congestion by auscultation of their thorax is necessary,, to perform the procedure as needed. The findings showed that 36 participants (90%) did not follow standard recommendations, which is in line with the studies of Kelleher and Andrews, Day et al., and Jansson et al. In the studies by these authors, they found that only six, two, and two nurses performed ETS assessment, respectively. In most cases (90%), the researcher observed that majority of nurses performed the procedure at the beginning of shift and at the time of delivery of the patients from the previous nurse. It raised the issue that they routinely perform the intervention instead of performing it only when needed. On the other hand, several criteria describe the potential indications for ETS, such as a raised respiratory rate, reduced SPO2 levels, skin color, pattern of respiration, coughing, increased work of breathing,,, and other changes in clinical signs as well as patients' behavior. Observational studies of clinical practices have suggested that the identification of the need for ETS is a complex issue. Thus, it is hard to judge whether pre-suctioning assessment practice conducted by nurses was on a routine basis or based on other clinical signs and patients' behavior. About 29 nurses (72.5%) did not communicate with the patients in any form and did not explain how the procedure would be performed. A 72.5% failure in this practice indicates that the weakness in compliance with the standards is high because care providers should normally explain to the patient what they are going to do and why it is necessary, as it is the patients' right to know, and on the other hand, informed patients are more cooperative.,, Similarly, 8 nurses (17%) of general ICU in the study of Kelleher and Andrews and 16 nurses (40%) in the study of Jansson et al. did not adhere to the best practice in patient preparation. About 13 nurses (32.5%) failed to assist patients into a semi-fowler position prior to suctioning when it was possible, which resulted in an uncomforted procedure for both the nurse and the patient, and not a lung expansion., About 12 (30%) and 13 (32.5%) subjects failed to provide hyperoxygenation prior to and after suctioning, respectively. However, ventilation and oxygenation during CSS is continuous. Demir and Dramal's study did not show desaturation when closed suction was used, even in the absence of hyperoxygenation. Many references firmly recommend hyperoxygenation prior to and after ETS., In the studies of Day et al., Kelleher and Andrew, and Jansson et al., 2 (7%), 17 (17%), and 17 (42%) participants were found not to perform hyperoxygenation in practice, respectively, which is in line with our obtained results. Although routine NaCl instillation is not recommended for ETS in literature,,,, subjects still failed to adhere to best practice in this issue. Many studies documented that NaCl instillation enhances secretion removal but may also create the sensation of dyspnea and even cause greater bacterial release in the respiratory system. All participants (100%) in Kelleher and Andrew's study refused saline instillation into the endotracheal tube, but in the study of Jansson et al., consistent with the present study, 25% of the nurses used saline instillation. In infection control aspects of ETS, majority of the participants (33, 82.5%) did not wash their hands and also 36 (90%) nurses did not wear goggles, although all of them were observed to wear gloves during ETS. Ventilator-associated pneumonia is the first common nosocomial infection in patients receiving mechanical ventilation, which increases mortality and morbidity. Because ETS interferes with normal body defense mechanism, maintaining aseptic techniques including hand washing and gloves wear are highly recommended. According to standard precautions, because of secretion splashing risk, even during CCS, the eyes should be protected by goggles. Meanwhile, 25 participants (62%) in Kelleher and Andrew's (2008) study and 14 participants in Jansson et al. 's study were found not to wash their hands. Also, all the subjects in both studies did not adhere to the best practice in eye protection, but wore gloves. These findings empower the hypothesis that nurses suppose that hand washing can be replaced by wearing gloves and a 90% discrepancy in eye protection may suggest that nurses underestimate secretion splashing during CSS. 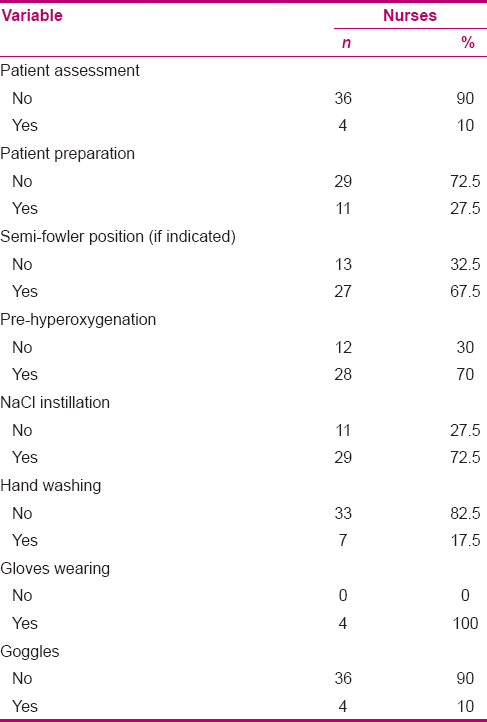 In the care of a patient, consideration of universal standard precautions, hand washing before and after patient contact, and eye protection precautions are essential, in addition to the wearing gloves and regardless of the suctioning method (open or closed)., Regarding the selection of an appropriate catheter size, 87.5% of the participants in the present study, like 40% participants in Kelleher and 's study, chose an inappropriate catheter size. In this regard, the judgment can be uncertain as there were only 16 catheter sizes in the setting that might have affected the power of choice. Guidelines recommend that the suction catheter should occlude less than half of the internal lumen of ETT, and a deficit in different catheter sizes affects adherence to recommendations. In the present study, 32 and 36 participants adhered to the recommended practice with regard to the number of suctioning events (<3 times) and active suctioning time (<10 s), respectively, compared to the nurses in Jansson et al. 's study (29 and 30, respectively) showing their moderate to high superiority in the practice. About 34 subjects (84%) used an appropriate negative pressure (80–150 mmHg); 38 subjects (95%) inserted the catheter to an appropriate depth and applied continuous pressure while withdrawing the catheter, and at the end, guaranteed full exit of the catheter by observing the black indicator and locked the catheter. Based on clinical experience and the results of studies, there are recommendations for using minimally invasive catheter insertion, continuous rather than intermittent suctioning during withdrawal of the catheter, and maintaining a patent ETT by taking out the full length of catheter at the end of procedure using CSS.,, Practices in relation with catheter irrigation and suctioning documentation are completely according to the practice recommendations. As shown in the results, most discrepancies were observed in nurses' practice in relation to the practices prior to ETS. Our findings are in accordance with other previous researches on ETS practices, especially in infection control practice.,, Another significant finding in our study was the positive relationship between passing the CSS educational course and nurses' total ETS practices score (P = 0.00). This finding is supported by other studies which revealed that initial knowledge and practice of the nurses in relation to ETS was poor,,, and reported a significant improvement in both knowledge and practice after educating the nurses (intervention).,, There was a positive relationship between length of working in ICU and ETS practice (P = 0.02), which can be logically accepted. The least practice score, attained in the present study, was for pre-suctioning aspects, which was a little different with open suctioning system. Findings showed that the mean scores were the minimum in pre-suctioning practices, especially in infection control aspects like hand washing, wearing goggles, and patient assessment and preparation. Although the ETS protocol adopted in the present study was similar to the standard international guidelines and the related written policy and procedure that are available for all nurses in ICUs, current practice was not based on recommended best practice. So, educational interventions are necessary for strengthening the nurses' knowledge and practice. Generally, because an observational method cannot interpret subjective decisions, some aspect of ETS practice, such as patient assessment for suctioning, may not be strictly evaluated except for chest auscultation. On the other hand, the observer cannot interpret whether the nurse's decision for suctioning, based on auscultation, was correct or not. Also, interpretation of the length of catheter insertion, when the care provider acts quickly, may be difficult. Such issues affect accurate interpretation of the observer in relation to subjects' practice. The present study was conducted in two general ICUs in a single university hospital; therefore, the findings may not represent the practice of the general population of critical care units concerning ETS. In general, based on the findings of this study, it can be concluded that the critical care nurses do not fully adhere to the best practice recommendations in CSS. This finding is consistent with the aforementioned previous studies on nurses' practice in OSS in other settings. Since previous studies have shown higher clinical values of closed-system ETS, the researchers recommend that standard guidelines on ETS practice be included in the current education of critical care nurses. Maximum deviation in score from the standard practice was observed in pre-suctioning practice, which is strictly associated with patients' safety and infection control. Trained nurses have a higher score, compared to those not trained. This highlights the need for more education in clinical setting and special practical educational interventions based on clinical standard guidelines. Also, continuing education, especially for ICU staff who work with sophisticated and modern devices and tools is so necessary. Overall, continuous evaluation of nurses' practice concerning implementation of the safe and correct procedures, based on best practice recommendations is so important. This article was derived from a master thesis of Somayeh Haghighat with project number 290091 Isfahan University of Medical Sciences, Isfahan, Iran. Copnell B, Tingay DG, Kiraly NJ, Sourial M, Gordon MJ, Mills JF, et al. A comparison of the effectiveness of open and closed end otrachel suction. Intensive Care Med 2007;33:1655-62. Jongerden IP, Rover MM, Grypdonck MH, Bonten MJ. Open and closed endotracheal suction systems in the mechanically ventilated intensive care patients: A mete analysis. Crit Care Med 2007;35:260-70. El Masry A, Williams PF, Chipman DW, Kratohvil JP, Kacmarek RM. The impact of closed endotracheal suctioning system on mechanical ventilator performance. Respir Care 2005;50:345-53. Pogotto IM, Oliveira LR, Cavalcanti Araujo FC, Carvalho NA, Chiavone P. Comparison between open and closed suction systems. Rev Bras Ter Intensiva 2008;20:331-8. Endacott R, Jeven P, Cooper S. Oropharyngeal, tracheal, and endotracheal suctioning. In: Endacott R, editor. Clinical Nursing Skills core and advanced. 1st ed. USA: Oxford University Press; 2009. p. 381-6. Pedersen C, Nielson R, Njermind J, Egerod I. Endotracheal suctioning of the adult intubated patient-what is the evidence? Intensive Care Nurs 2009;25:21-30. Noll ML, Hix CD, Scoth G. Closed Tracheal Suction System: Effectiveness and Nursing Implications. AACN Clin Issues Crit Care Nurs 1990;1:318-28. Berman A, Snyder SH, Kozier B, Eeb G. Promoting physiologic Health. In: Kozier B, Eeb G, editors. Kozier and Erb's Fundamentals of nursing, concepts process and practice. 8th ed. United States: Pearson Prentice Hall; 2008. p. 1382-9. Crimlisk JT, Paris R, McGonagle EG, Calcutt JA, Farber HW. The Tracheal Suction System: Implications for Critical Care Nursing. Dimens Crit Care Nurs 1994;13:292-300. Potter PA, Perry AG. Basic Human Needs. In: Potter PA, Perry AG, editor. Fundamentals of Nursing. 7th ed. Philadelphia: Mosby; 2008. p. 938-41. Blackwood B. The Practice and Perception of Intensive Care Stuff Using the Closed Suctioning System. J Adv Nurs 1998;28:1020-9. Swarts K, Noonan D, Edward-Bekett J. 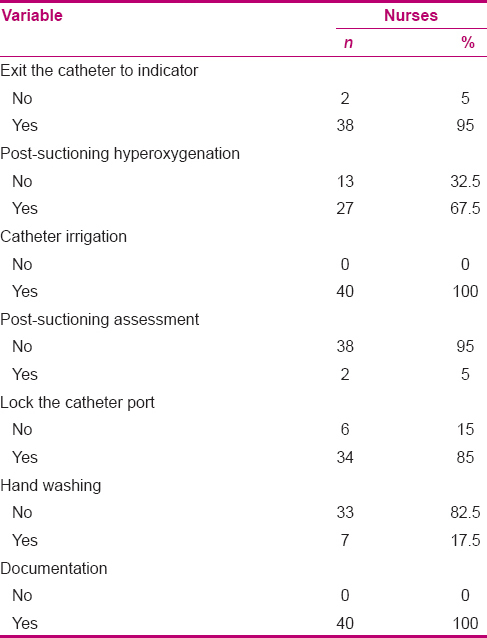 A National Survey of Endotracheal Suctioning Techniques in the Practice Population. Heart Lung 1996;25:52-60. Kelleher S, Andrews T. An Observational Study on the Open-system Endotracheal suctioning Practices of Critical Care Nurses. J Clin Nurs Pro 2008;17:360-90. Sole ML, Byers JF, Ludy JE, Zhang Y, Banta CM, Brummel K. A multisite survey of suctioning Techniques and Airway Management Practices. Am J Crit Care 2003;12:220-32. Paul-Allen J, Ostrow CL. Survey of nursing practices with closed-system suctioning. Am J Crit Care 2002;9:9-17. Day T, Farnel S, Haynes S, Wainwright S, Wilson-Barnett J. Tracheal Suctioning on Exploration of Nurses Knowledge and Competence in acute and high dependency ward areas. J Adv Nurs 2002;39:35-45. Celik S, Elbas N. the standard of suction for patients undergoing endotracheal intubation. Intensive Crit Care Nurs 2000;16:191-8. Criage J, Smyth R. The evidence based practice manual for nurses. London: Churchill Living Stone; 2007. Polit D, Becke C, Hungler B. Essential of nursing research. Method, Appraisal and utilization, 5th edn. Philadelphia: Lippincott, Williams and Wilkins; 2001. Fitzpartick JM, While AE, Robert JD. The measurement of nurse performance and its differentiation by course of preparation. J Adv Nurs 1994;20:761-8. Wilkinson JM, Leuven KV. Procedure checklist for fundamentals of nursing: F.A. Davis Company; 2006. Brearley L. Royal Perth Hospital critical care Division nursing practice standard for the management of a patient with an endotracheal tube. Critical Care 2004. Harada N. Closed suctioning system: Critical analysis for its use. Japan J Nurs Sci 2010;7:19-28. Jansson M, Ala-kokko T, Ylipalosaari P, Kyngas H. Evaluation of endotracheal suctioning practices of critical care nurses- An observational correlation study. J Nurs Du Pra 2013;3:99-105. AARC Clinical Practice Guidelines. Endotracheal suctioning of mechanically ventilated patient with artificial airways 2010. Respir Care 2010;55:758-64. Available from: http://www.g-i-n.net/library/health- topiCSS -collection/guidelines/ahrq- us/endotracheal- suctioning-of-mechanically- ventilated-patients-with-artificial- airways-2010.-american-association-for- respiratory-care.- ngc-008013 [Last accessed on 2011 Jun 21]. Morrow BM, Argent AC. A comprehensive review of pediatric endotracheal suctioning: Effects, Indications, and clinical Practice. Pediatr Crit Care Med 2008;9:465-77. Thomas M, Fothergil l, Bourboonais F. Clinical judgments about endotracheal suctioning: What cues expert pediatric critical care nurses consider?. Crit Care Nurs Clin North Am 2005;17:329-40. Demir F, Dramal A. Requirement for 100% oxygen before and after closed suction. J Adv Nurs 2004;51:245-51. Yazdannik AR, Haghighat S, Saghaei M, Eghbali M. Comparing two levels of closed system suction pressure in ICU patients: Evaluating the relative safety of higher values of suction pressure. Iran J Nurs Mid Res 2013;18:117-22. Ruffel A, Adamcova L. Ventilator-associated pneumonia: prevention is better than cure. Nurs Crit Care 2008;13:44-53. Siempos 2nd, Vardakas KZ, Falagas ME. Closed tracheal suction systems for prevention of ventilator associated pneumonia. Br J Anaesth 2008;100:299-306. Augustyn B. Ventilator- Associated Pneumonia, Risk Facrors and Prevention. Crit Care Nurs 2007;27:32-9. Hahn M. 10 consideration for endotracheal suctioning. RT: For Decision Makers in Respiratory Care 2010. Available from: http://www.rtmagazine.com/issues/articles/2010-07-06.asp. [Last accessed on 2010]. Day T, Wainwright SP, Wilson-Barnett J. An evaluation of a teaching intervention to improve the practice of endotracheal suctioning in intensive care units. J Clin Nurs 2001;10:682-96. Day T, Lles N, Griffiths P. A randomized control trial to assess the effect of performance feedback on tracheal suctioning knowledge and skills. J Adv Nurs 2009;65:1423-31. Kargar M, Hadian Shirazi Z, Edraki M, Pishva N, Ghaem H, Chohedri AH. The effects of ETT suction education on the knowledge and performance of intensive care nurses. Anaesth Pain Int Care 2006;12:5-10.